Push the remote release button. A locked trunk lid can also be opened while the key is being carried. Press the electric trunk lid opener on the trunk lid, then raise the trunk lid when the latch releases. When opening the trunk lid with the doors locked, it may require a few seconds for the trunk lid latch to release after the electric trunk lid opener is pressed. The trunk lid can be closed when the doors are locked with the key left in the vehicle. However, to prevent locking the key in the vehicle, the trunk lid can be opened by pressing the electric trunk lid opener. 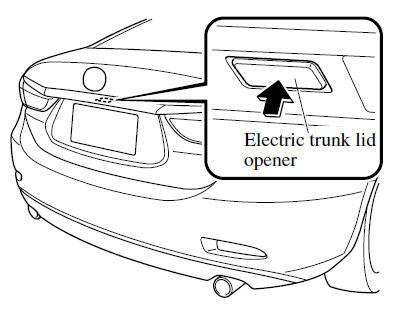 If the trunk lid cannot be opened despite doing this procedure, press the electric trunk lid opener to fully open the trunk lid after pushing the trunk lid completely closed. If the vehicle battery is dead or there is a malfunction in the electrical system and the trunk lid cannot be unlocked, the trunk lid can be opened by performing the emergency procedure. Refer to When Trunk Lid Cannot be Opened. 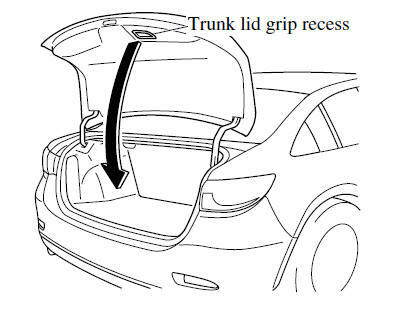 To close, lower the trunk lid slowly using the trunk lid grip recess, and then push the trunk lid closed using both hands. Do not slam it. Pull up on the trunk lid to make sure it is secure.